It is simple to install due to 1+1 reduced* wiring technology four-way audio kit composed by surface mounted external 1 call button door entry panel made from anodised aluminium and four wall mounted white colour Exhito audio handsets. Agora is the name of the new line of Aci Farfisa audio/video door stations. Modular in design, it is characterized by the extremely thin profile and simple surface mounting. Therefore, less work and less time is required for installation. The width dimension of the Agora basic module is really reduced allowing to be installed even in small spaces such as gate posts. *Only a single communication cable is required between the entrance panel and the handset for wiring. The advantage is a simplified installation, with traditional basic features of the systems and an excellent quality/price ratio. The 1AEXD 4 way audio kit includes an Agora surface mount panel that is only 30mm deep with blue back-lighting. The kit can easily be expanded for up to 4 users. Systems for more than 4 users can are achivable by using the AG100T enclosure. 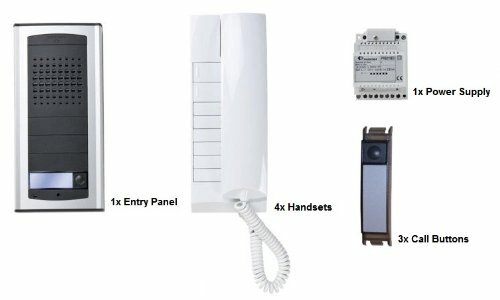 • It is simple to install due to 1+1 reduced* wiring technology four-way audio kit composed by surface mounted external 1 call button door entry panel made from anodised aluminium and four wall mounted white colour Exhito audio handsets. • Agora is the name of the new line of Aci Farfisa audio/video door stations. Modular in design, it is characterized by the extremely thin profile and simple surface mounting. Therefore, less work and less time is required for installation. The width dimension of the Agora basic module is really reduced allowing to be installed even in small spaces such as gate posts. • *Only a single communication cable is required between the entrance panel and the handset for wiring. The advantage is a simplified installation, with traditional basic features of the systems and an excellent quality/price ratio. • The 1AEXD 4 way audio kit includes an Agora surface mount panel that is only 30mm deep with blue back-lighting. The kit can easily be expanded for up to 4 users. Systems for more than 4 users can are achivable by using the AG100T enclosure.